"Radisol" is not the only quality service. Also we offer the opportunity to earn using our referal programm. This offer may be interesting for companies is engaged in creation of websites and IT-freelancers. Customer registers using your partner code, and you get deductions up to 30% from all payments which customer will pay. 25% When all your attracted customers paid more then 5000 rubles. 30% When all your attracted customers paid more then 10000 rubles. To make order of funds withdrawal, you should send request from control panel using "Support center". Mark request with theme "Partnership"
Request body should include funds withdrawal type. If it is WMR - include WMR number. If it is hosting account - include account number. Access to control panel data will be sent to your email. 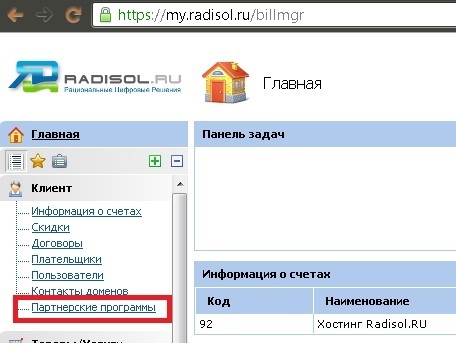 Login to billing control panel heremy.radisol.ru. Username and password were sent to your email after registraton. After that you'll see your referal link which you shuold use to register your customers.